General oblique aerial view of Torrisdale Bay, taken from the N.
See also NC66SE 6 and NC66SE 9. The Sandy Dun (Horsburgh 1870) a broch high up on a cliff edge, consists of a tumbled mass of stones. The interior is filled with rubble and sand, but the inner face, a few feet in height with a 10 inch wide scarcement of thin slabs, is visible for the complete circuit; the outer face protrudes through the tumble on the south and NE sides, indicating an internal diameter of about 8.5m and a wall thickness of 4.0m. The entrance passage in the SW has collapsed and is covered by rubble. A small annexe 8.0m by 5.0m abuts the broch on the west, and further west is a wide natural ditch which serves as a defence. J Horsburgh 1870; RCAHMS 1911, visited 1909. The broch, protected on three sides by steep rocky slopes and approached from the west across a low saddle, is generally as described by the previous authorities. In recent years a crude wall has been built around the top of the inner face. The position of the entrance is uncertain, but the most likely situation is in the west arc at the easiest means of approach, where one possible lintel slab is partially exposed in the tumble. This west side is further defended by the remains of an outer wall, which probably extended to connect with the natural slopes of the north-west and south-west of the broch, utilising in its course natural rock outcrops, but severe denudation and overburden of stone fallen from the broch renders its extent uncertain. A short stretch of an outer base course is evident towards the north end adjacent to a gap corresponding to the assumed broch entrance. Outside of this there are traces of a possible wall fringing the access way, but recent reconstruction confuses the nature of the remains. The name 'Sandy Dun' cannot be verified. Visited by OS (N K B) 27 September 1978. This unexcavated probable broch in Farr, Sutherland, stands on an extremely high and steep conical hill overlooking the west side of the sandy estuary of the river Naver (visited 9/7/63 and in 1985 - in the latter year the site was only photographed from a distance). The site is 68.5m (225ft) above the sea but it is full of wind-blown sand which obscures many structural details. There are many traces of enclosures, hut circles and cairns on the Invernaver raised beach to the east . The Commission saw the entrance on the south-west sidein 1909 but this is not now clear; Swanson places it on the north-west because of a gap in the wall debris and because of an apparently in situ lintel at its outer end . A ledge-type scarcement about 23cm (9in) wide was visible in 1963 on the inner wallface on the west side but Swanson says that, by June 1985, some rebuilding had been done in the interior and the scarcement had been largely concealed by freshly laid stonework . At 12 o'clock there is another doorway into the wall from the interior which has been completely filled by the reconstruction work, its position being traceable by a vertical slab in the middle of the wall which is presumably part of its side [7, plan]. This is likely to be above scarcement level (though Swanson does not specify this) and therefore to lead to some feature in level 2, perhaps an upper gallery; there is a possible gallery face just anti-clockwise from this [7, plan]. Alternatively it might be part of the doorway to a stair or intra-mural cell . The position of the site is almost impregnable with steep slopes falling away in all directions except along the ridge towards the sea. Young classes the site as a dun but there is no reason to distinguish it from the other ruined brochs in the vicinity. The wall of this 'tower' was apparently 2.44-3.05m (8-10ft) high in 1867 . There are traces of a wide natural ditch on the west side , where the easiest approach is made, across a low saddle. Mercer classes the site as a “fortlice broch”, one of a small number built in exceptionally strong positions and which seem therefore not to be as closely linked with farmland as most. The outer wallface is obscured but the measurements made in 1909indicated a wall thickness of 3.66m (12ft). The internal diameter is 9.67m (29ft) and the external one must be about 16.2m (53ft) if the wall is 3.66m (12ft) thick all round: if so the wall proportion would be about 45.5%. Swanson gives the internal diameter as 8.2m north/south so the Commission was probably measuring above scarcement level. If so the wall proportion is about 49.5%. Sources: 1. NMRS site no. NC 66 SE 2: 2. Horsburgh 1868, 272 and 274: 3. Mackay 1906, 132: 4. RCAHMS 1911a, 61, no. 184: 5. Young 1962, 188-89: 6. Mercer 1981, 20-21 and 107, no. 7: 7. Swanson (ms) 1985, 709-12 and plan. flanking wall to the SW of the broch contains a substantial mass of well vitrified stone, apparently embedded below non-vitrified wall material. This seems to have been created in situ rather than imported as construction material. 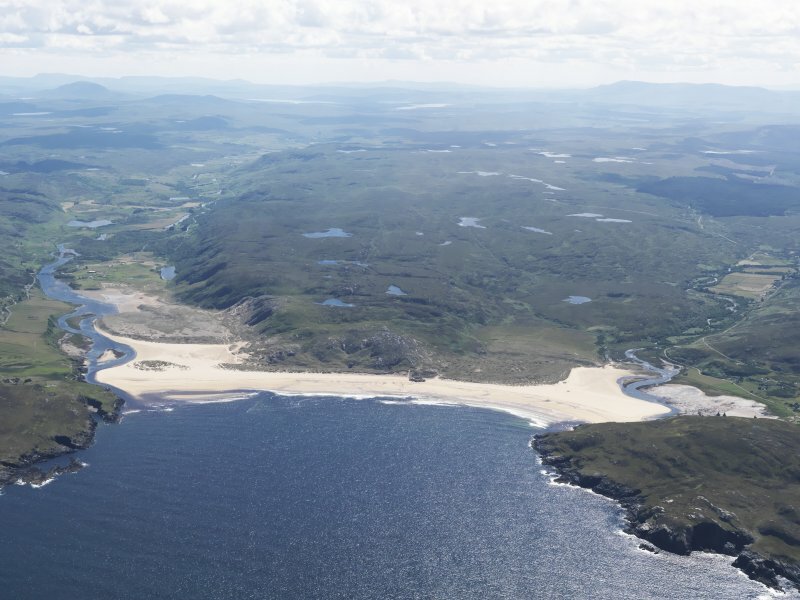 Inspection of the slopes below the broch revealed only small quantities of this material, suggesting the vitrified portion may only recently have become exposed, perhaps through visitor erosion.